Does leaving mini-bag-tag stickers on your luggage confuse airport bagging handling? It used to be quite a tradition to keep stickers from destinations you'd been on your luggage after your travels, rather than ripping them off, building up souvenirs over time. This seems to me like a fun idea. However, I haven't seen it as much recently. "Fun" stickers with no meaning to airport personnel. These seem harmless and I assume you could add them/leave them in place. Miscellaneous security stickers specific to various airports/airlines. Again, many people seem to be able to leave them in place. Regular large bag tags, usually looped round the handle. I normally remove these after each trip, and I assume not doing so could confuse things. Mini barcode stickers (I'm not sure what the official name is), to act as a "backup" for the regular bag tags, stuck directly to the luggage. Again, I normally remove these. I noticed the other day someone with mini barcode stickers all over the outside of their bag. However, I understand that many airports these days have automated scanners that read these. If I was to start the same habit, would my bag end up in the wrong place one day? What about the other types, especially the regular bag tags? This bag is literally covered in the barcodes and has never not made it through. I am curious about a) the algorithm that ignores the old tags and b) the readers that can scan so many barcodes at once. EDIT: The very next day after posting this issue, somewhere between Sweden and Australia, someone at some airport decided to cover most of the stickers with a white label. Must have had some issues reading the barcodes, or thought it was a good idea for some other reason. What a coincidence that it happened the day I posted this comment! If you are talking about stickers like these then you will not encounter any issues. They are decorative and fun. The small bar code stickers that match the bag tag that's being attached to your suitcase handle at checking should be removed. The purpose for these small bar code stickers is to help identify and route your bag should the large tag be lost or damaged. Leaving a bunch of these bar code stickers on will make it hard to identify your bag and ensure that it arrives with you at the destination with you. Aside I don't see them being aesthetic either. I don't normally bother removing these, but a couple of years ago at LHR airport the employee at the check-in desk said that old barcode stickers can confuse the scanning equipment used in baggage handling. She used a black pen to cross through some of these before dispatching my luggage. More recently, like one of the above posters, I had white stickers placed over old barcode stickers on my luggage. 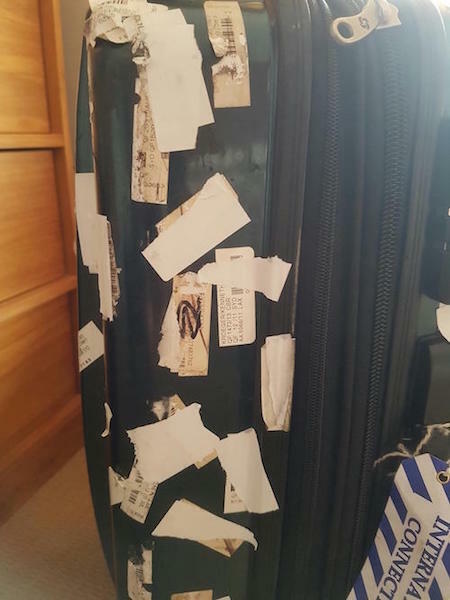 When I lived overseas, I used a bag (now fallen apart) that had stickers from the places that I had travelled to, I never really had any problems as the baggage handlers looked only at the official and current airline travel tag. I think (and please someone correct me if I am wrong), that the barcode on the tag that they use has the date encoded. One stage I had over 20 such stickers. A piece of cautionary advice: If possible, avoid embellishments (either in the form of prior travel stickers, or overly expensive designer baggage) when your bag is travelling separately from you, as is the case with airline check-in baggage. The reason for this is simple - burglary! The fancier your baggage, either from travels to numerous countries, or certain pricey hotel tags, or just simply being expensive, may represent, to someone, a certain degree of wealth, making the baggage prone to theft. This is especially true when travelling to developing countries, where security is less, though I have also heard of this happening in American and European airports. Bottom Line: Certain distinguishing marks are okay, but if stickers are serving no purpose, spend a few minutes on ripping them out, for more reasons than just confusion. Regarding "Mini barcode stickers (I'm not sure what the official name is), to act as a "backup" for the regular bag tags, stuck directly to the luggage." http://www.slate.com/articles/life/design/2012/10/airline_baggage_tags_how_their_brilliant_design_gets_bags_from_point_a_to_point_b_.html: "Technically known as bingo tags, removable stubs, or stubbies." Sometimes referred to as bingo stickers as well. Old bingos left on bags can even confuse sophisticated sortation systems in newer airports, sending it to a reject belt for manual processing. However, if you have a multi sector journey, removing a bingo sticker may actually lead to your bag being left behind due to a reconciliation failure. X - Former Baggage Tracing Manager for a large airline. Not the answer you're looking for? Browse other questions tagged air-travel luggage or ask your own question. 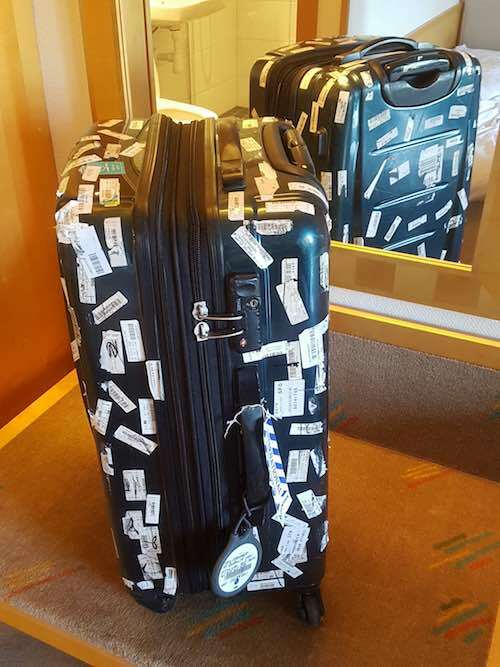 What's the point in placing small barcode stickers on one's check-in bags? Why do you need to take out your laptop from your bag during airport security checks? Travel protection bag OK at airport? 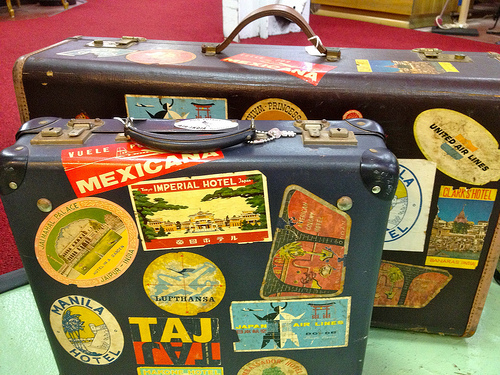 Is this luggage likely to be considered oversized as checked baggage? What does an 'X' mark on my checked-in luggage mean at Mumbai Airport exactly? What happens when you are asked to place item in the hold (checked-in) luggage? How long does it take to get your checked-in bag at London Gatwick airport? How does airport security search through one's luggage? How long should I keep the bag tag and its receipt? What to do with the small barcode stickers? When Cabin Luggage weight limit is mentioned as 7kg, does it also include Laptop bag weight?